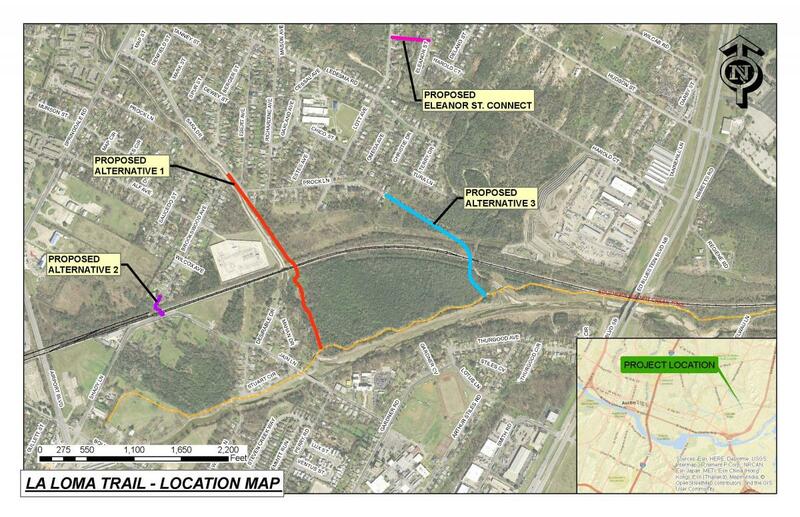 Funded for Preliminary Engineering Report, by the 2016 Mobility Bond, the La Loma Trail will provide East Austin residents and the neighborhoods near the proposed trail with crucial connectivity to the Southern Walnut Creek Trail and Eastside Memorial High. Staff is preparing to draft the Preliminary Engineering Report (PER). A PER evaluates all the environmental constraints of the project including: topography, drainage, various soil types, tree canopy, wildlife habitat, floodplain, surrounding land uses, location of utilities, cultural assessments, critical environmental features, endangered species, property ownership, as well as several other elements. Currently, funding has not been identified for design or construction. Below you will find potential trail routes for the La Loma Trail. Click to view larger map. Fall 2017 Pre-Preliminary Engineering Report Meet with community members, stakeholders and land owners. Execute preliminary feasibility studies, gather data regarding topographic, natural and other elements of potential trail connections. Join us Tuesday, Oct. 17 for a public meeting on the La Loma Trail. View the meeting presentation. Sign up to receive updates on the La Loma Trail's progress.